GREEN BAY, Wis. -- Corey Linsley needs no reminder that one of Aaron Rodgers' greatest throws -- maybe even the best one the Green Bay Packers quarterback has ever made -- did not count because of his mistake. "Believe me, I know that," Linsley said Friday with a guilty smile. "I've watched it many a time and felt embarrassed many a time." But here's the beauty of Linsley, the Packers' rookie center: Four days after his holding penalty wiped out an acrobatic throw in the face of pressure that would have been a ridiculous 34-yard touchdown pass to Davante Adams against the Chicago Bears on Sept. 28, Linsley made sure to disengage from Minnesota Vikings nose tackle Linval Joseph before he could be flagged again and another touchdown -- this one a 66-yarder to Jordy Nelson -- could be wiped out. "That's a credit to him because he's learning from his mistakes," Packers offensive line coach James Campen said this week. Not that there have been many of those. But it's one of the reasons Campen and coach Mike McCarthy are likely to stick with Linsley as their starter even after JC Tretter comes off the temporary injured reserve list. Tretter spent all offseason and most of training camp being groomed as the starter until a knee injury in the third preseason game forced Linsley, a fifth-round pick from Ohio State, into action without any preseason snaps with Rodgers. "He's one of those guys as a rookie that came in here and you knew right away he belonged," McCarty said of Linsley. "First day of pads, it was like, 'Hey man, this guy, he's a powerful young man.' So he fit right in. That's why I was never worried about him." Tretter is eligible to begin practicing on Monday and could play on Nov. 9 against the Bears, but the Packers may not need him given how entrenched Linsley appears. "I will say this: If things keep going the way they're going, I think we’ll look back on this start as probably one of the most impressive situations that a young player has stepped up and performed in my time here," McCarthy said. "And we've had a lot of guys step up." And there's little or no reason to use any caveat in this case. Linsley has not allowed a sack or a quarterback hit, according to Pro Football Focus. In PFF's run-game rankings, he graded out as the second-highest lineman on the Packers roster behind only left guard Josh Sitton. 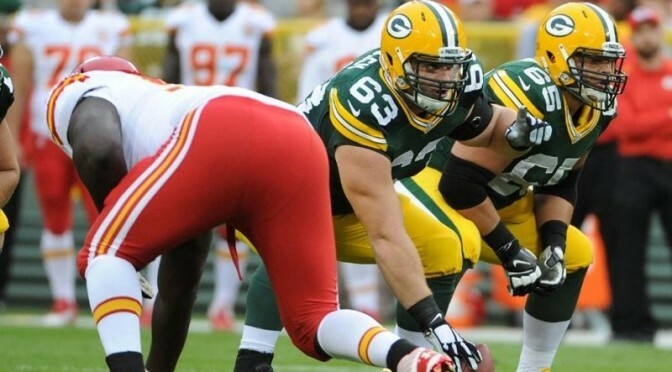 And for all NFL centers this season, Linsley's run-blocking grade ranks tied for eighth. Perhaps more importantly, he has gained Rodgers' trust. And that trust went up another notch after Linsley's block on Nelson's 66-yard touchdown catch against the Vikings. "There's often an unsung hero, and it's always fun to be able to highlight those guys," Rodgers said this week on his ESPN Milwaukee radio show. "In this case, it was Corey doing a nice job of keeping his feet moving and running his defender past the play and allowing me to throw from a clean spot. That's when you get touchdowns."